Text and pix by K.K.D.Premalal -Matugama Spl. Cor. 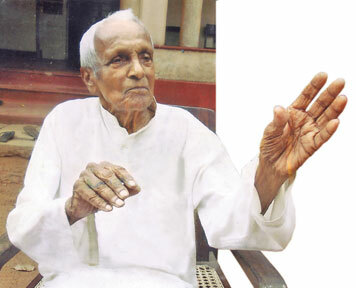 Former MP for Matugama, one of the most senior members of the Sri Lanka Freedom Party, Daya T Pasqual celebrated his 100th birthday yesterday in Matugama in a simple manner with those who are dear and near to him. 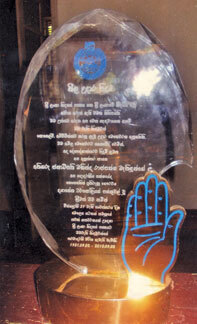 The plaque he received from the SLFP on its 59th anniversary. Living up to 100 years is a minor miracle considering the increasing number of deaths taking place in modern times. People are afflicted with various kinds of illnesses at many stages of life but a few people have the fortune to live long. Daya Taranolis Pasqual, better known as Daya T. Pasqual, was born on June 9, 1912 in a remote village called Uragoda, Welipenna in the Matugama electorate. He was not born with a silver spoon in his mouth. Being the eldest of a family of 13 members, he had to shoulder a lot of responsibilities to help his parents to bring up their children. Pasqual has reached his 100 year but he is still hale and hearty. He always extends his helping hand to needy people in the area without thinking of what he would gain. He is neither a fanatic nor a blind follower of Buddhism. He reminisced his childhood memories to the Sunday Observer "My father was a farmer and those days farmer was called "Govi rala" and my mother was an astrologer in the area. Being the eldest in the family, I had to help my parents by doing errands and odd work at home. When my mother had "Vilirudawa" (labour pain), I had to convey the message to a woman called "Kabara Archchi' who performed the duty of midwife. Anyway, I helped my parents with pleasure. 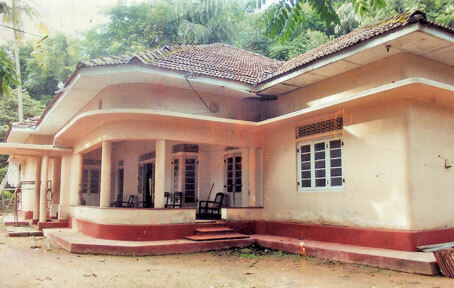 He received his primary education at the only Sinhala School in Matugama. It was at the present bus stand premises in Matugama. He pursued his higher education at Ananda Shastralaya, Kotte under the able guidance of the late Dr E.W. Adikaram. He excelled in studies. Pasqual lives in an old spacious house with a domestic aid. He is looked after by his close relatives. The only furniture available in the house are a few chairs and an old bed. He does not watch television or use mobile phones. The only way he keeps in touch with the modern world is through reading newspapers. He said his favourite newspaper is the Sunday Observer. Recollecting his fond memories Pasqual said once he received a letter from the Defence Ministry during the UNP regime asking him to return the fire-arms which he had taken from the government to the Matugama police station. He immediately replied saying that he had never used any fire-arms. He also said the only weapon he possessed was his old umbrella which he did not want to part with. Later the Defence Secretary had apologised to him over the matter. On another occasion, he had gone to a reputed hotel in Colombo with D.A. Rajapaksa for a vegetarian meal. The waiter had brought meals with fork and spoon. However, he asked the waiter to bring a finger bowl. After having meals, he ordered dessert. The waiter had brought a cup of fruit salad without a spoon. Pasqual said the waiter had done it purposely. He also said that somehow he managed to eat the fruit salad without a spoon! However, he complained to the manager regarding the waiter's conduct. The best part of the story was it appeared in the now defunt Evening Times headlined "An ultra nationalist MP experiences inconvenience". Revealing the secret of his longevity, Pasqual advises people to live with nature. He also stressed the need to lead a religious life observing the Five Precepts. He said, "I have not been afflicted with any serious illness so far. Whenever I get a minor cold, I use paspanguwa, an aurvedic medication. I am a vegetarian too. I have never tasted liquor in my life time. I am also a non-smoker. Today, he said, "people are running a rat race and eat junk food. They do not take regular exercise. I used to walk two or three miles a day which helped me lead a healthy life. However, modern people do not like to walk; They hire a three wheeler even for short distances". "We had a large number of buffaloes and we never bought rice and vegetables at the village boutique. We had enough rice and vegetables for consumption since my father was a farmer. I can still remember vividly how I ate curd with red rice which is supposed to be very nutritious. Drinking enough water is another contributory factor for my good health". Pasqual was elected to Parliament as the MP for Matugama in 1956 and retained his seat for 21 years. He won each election with a sweeping majority. He got the highest number of votes in 1956 coming second only to Attanagalle. Matugama is still known as "Punchi Attanagalle". He played different roles as a member of Parliament. He was a deputy minister and a deputy chairman of the parliamentary committees. He did his best to develop the electorate during his tenure.He was never surrounded by bodyguards. When he was offered a ministerial portfolio, he declined to accept it. He did not make money while doing politics. Instead he spent money for the well-being of the people in Matugama. He is the most senior member of the SLFP. He did not switch loyalties and remained a steadfast SLFPer from its humble beginnings. He was felicitated by the SLFP at its 59th anniversary. Commenting on the present political situation, Pasqual said President Mahinda Rajapaksa is the strongest leader the SLFP had ever produced. He also said the President saved the motherland from the iron grip of the LTTE. He said, "The Rajapaksas have been true patriots and I am sure that the country will prosper in the years to come". Politicians of Daya T. Pasqual are very rare indeed and he will set an example for the up and coming politicians in Sri Lanka. When considering the ripe old age and his daily routine, one is reminded of Shakespeare's words "Some never seem to grow old. Always active in thought, always ready to adopt new ideals, they are never changeable with egoism. Satisfied, yet ever dissatisfied, settled, yet ever unsettled they always enjoy the best of what is, and are the first to find the best of what will be. "Though I look old, yet I am strong".